I have been making jewellery for nearly 30 years using many materials; glass beads, lead crystals, pearls, semi-precious stones, polymer clay, fabric and wire. Often, a unique piece be it cabochon or bead, will set me off on a beading journey. I have published work in Bead, Beadwork, Vogue and WI Life (Nov/Dec 17 issue) magazines. I live in a rural area of rolling hills, forest and open farmland which along with my love of art - from Renaissance to Impressionist and post-Impressionist – inspire my work and keep my mind buzzing with ideas. 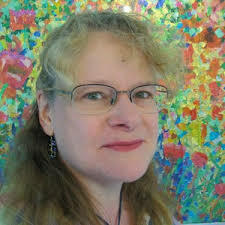 ​I love painting in oils, pastels and acrylics, plus I am learning to crochet and hand-stitch patchwork.